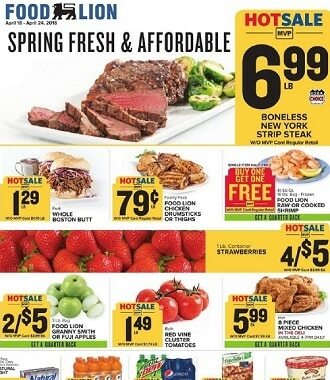 Browse Food Lion Weekly Ad Sale, valid Wednesday, April 17 – Tuesday, April 23, 2019. Don’t miss the Food Lion Ad Specials for this week and grocery discounts & sales. Great savings for Jif Peanut Butter, Maxwell House Coffee, Gain Laundry Detergent, Beef Shoulder Roast, Flounder Fillets, Cedar Plank Salmon, Nature’s Place Organic Honey, Nature’s Place Organic Ketchup, Campbell’s Homestyle or Chunky Soup, Tostitos Tortilla Chips, Haagen-Dazs Ice Cream, Downy Liquid Fabric Softener, Kibbles ‘n Bits Dry Dog Food, Large Red Seedless Grapes.